If you were to name yourself after an animal, which one would you pick? In first grade, enamored of alliteration, I went around calling myself Evie Elephant, which later made me wonder about deep-rooted body image issues! To understand these panels, you have to read from right to left. They were originally created in Japanese, then translated. To my great surprise, publisher Peter Goodman (who also published my book Crazy for Kanji) explained to me that the book is bound Japanese-style with pages running from right to left, as well. That’s the way almost all manga are published in English these days, he said. Otherwise, publishers would have to flop the images, which means (among other things) that all the right-handed people would suddenly look left-handed! "Publishers used to do that," he said, "but it is way too expensive, and with Japanese artists complaining about their work being messed with, publishers and readers just accept that manga from Japan is published Japanese-style, except for the English translation, of course. It would be more of a surprise had we not done it the way we did." I'm not sure if I'm more surprised by this news or by the fact that Osamu Tezuka named himself after a bug! But let's go back to that topic. As the second panel shows, the artist's given name was simply 治 (おさむ). He was such a big insect fan that when he found out that there was actually a bug called おさむし, he playfully added 虫 (むし: insect) to his name. The wordplay with Tezuka's name didn't end with his childhood. When he grew up and worked as a manga artist, he tended to be quite slow, always on the verge of missing deadlines. His editors nicknamed him オソムシ, drawing on 遅い (おそい: late)! Although 歩行 breaks down as to walk + to go, 歩行 as a whole means "walking." The insect is called that because its wings have atrophied, leaving it unable to fly. It can move only by walking! 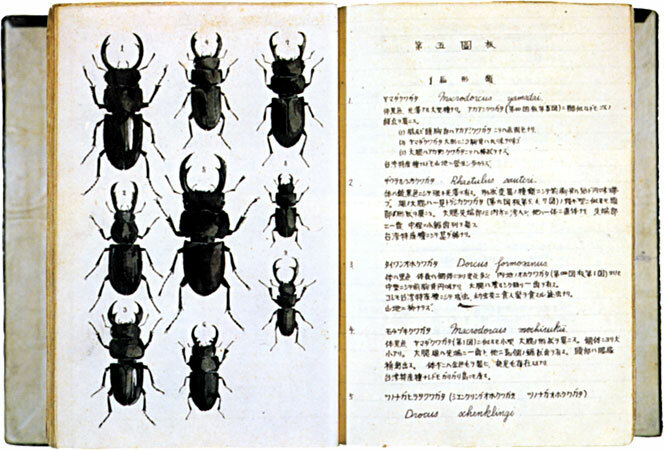 The insect pyramid 蟲 is a non-Joyo variant of 虫. That is, 昆蟲 corresponds to the contemporary rendering 昆虫 (こんちゅう: insect). By the way, 昆 means "insect," just as 虫 does. He became such an enthusiast that he created his own insect guide. And people think a passion for kanji is weird?! I later learned that in 手塚寓 (てづかぐう), the 寓 humbly indicates that the house belongs to the family indicated. Speaking of names and humility, there's one more thing to share. Because Tezuka was so famous and revered, another manga artist named Hidehiko Tezuka (手塚秀彦, 1961–) avoided using his real surname when making his debut because he worried that calling himself Tezuka would sound arrogant! He worked under the pen name 島本和彦 (しまもと かずひこ, in which 彦 is non-Joyo) and succeeded anyway. Glad to hear it!